Built to celebrate the country’s centennial - though opened a few years later - the Chilean National Library is reaching one hundred years. A building with the ambition of hosting all the printed production of a country requires a particular architecture. However, is the country the same than a century ago? Are the enlightenment ideals behind a building like this still valid? 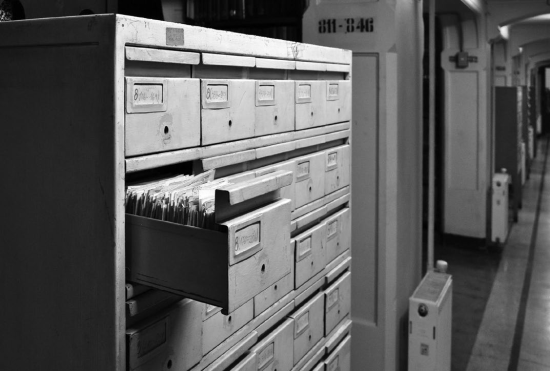 In the end, what is a national library and what it can be today? At the beginning of the nineteenth century, right after the United States’ independence and France’s abolition of monarchy, Latin American countries heard the call of global republicanism and set out to produce the new. For several years, the whole continent was a laboratory of invention: which institutions should these new countries have? How should these new nations govern, organize and describe themselves? How should they relate to their common, colonial past, and how far should they go in the process of reinventing themselves? In the majority of the Latin American countries, knowledge was a fundamental part of that self-definition, with the proclamations of National Libraries running in parallel to armed battle: Argentina establishes its National Library in 1810, Uruguay in 1816, Perú in 1821, Colombia in 1825, Bolivia in 1825. (W)hen a foreigner comes to a country unbeknownst to him, he derives an idea of its knowledge by its libraries and other literary institutes, and the first step the people take in order to be wise, is to acquire great libraries (Henríquez, 1813:215). The enlightenment of the nation’s people and a cosmopolitan look are what drove these patriots, and the way to achieve it was through the creation of a network of institutions: together with the National Library, the secondary-education National Institute was created (1813) and later, the University of Chile (1843), all of which would be followed by the establishment of similar institutions across the country (Rengifo et al., 2012). They were mostly all built upon colonial predecessors and often literally so, as it happened with most of the Jesuits’ resources throughout the country. And the same happened throughout the continent: both the pre-history of a shared colonial past and the utopian, common, republican goals of the American Libertadores set the basis for a continental network of intellectual institutions, at least connected in their definitions. They were all enacting a paradigm change: they were the product of encyclopedic, enlightened, analytic knowledge. Roland Barthes, in his essay “The Plates of the Encyclopedia,” refers to its images as constituting a “structure of information”, a mechanism of familiarization with “the world of objects” (Barthes, 1980:29). This is what an entrepreneurial, Sorbonneformed, Chile-residing naturalist called Claude Gay did: in 1830, he proposed to the Chilean government the monumental composition of a physical and descriptive history of the newly-formed nation, a complete geology and a full survey of productive activities and population, together with a natural history cabinet. In proposing this he was mimicking what Humboldt and Darwin had already made, but only on a smaller scale (Sagredo, 2012). It was a respectable scale, nonetheless: Gay walked the country for several years, compiling all the data, and producing heaps of information (Sagredo, 2010). Reliable cartographies registering mountains, lakes, currents and rivers, and drawings making inventories of people, plants and animals were part of the construction of an encyclopedic vision of the wealth of an emergent country, which would later become a thorough inventory, the Atlas of the Physical and Political History of Chile, to be sold both in Europe and in Chile. Gay not only gathered the information but identified, named and classified, producing at the same time both an “inventory and a definition” (Barthes, 1980:24). This, as Barthes would say, is of course never a neutral idea, for “to catalogue is not merely to ascertain (…) but also to appropriate. The Encyclopaedia (and in our case, Gay’s Atlas) is a huge ledger of ownership” (1980:27). The classification and inventorying of the land’s people, flora and fauna allowed the particularities (and identities) of an emergent nation to be made visible - and, after signaling them, made them subject to be ruled by the new power organization. Furthermore, Gay’s “Map for the intelligence of the Physical and Political History of Chile” (1854), in the approximate scale of 1:2.000.000, depicts for the first time a total vision of the country, offering not only a cartographic register of the territory, but a means for channeling it into the status of Chilean land. These efforts contributed to construct the space of the young Republic, setting the foundations of a national territory, both physical and cultural. So, that Claude Gay’s Atlas would then be one of the first custom-made, newly acquired items in the National Library’s collection only reaffirms the fact that those pictures contained not only a “structure of information” but were part of a nationwide ‘infrastructure of formation.’ What is known can be administered, what is unknown can be surveyed, normalized, appropriated - and then administered. One of them was the National Library: the hundred-years-old institution would finally be materialized with the construction of a building. Until then, the institution had been lodged in five different locations: from 1813 to 1828, it was part of the University of San Felipe (the Jesuit institution that preceded the University of Chile), and was located in the block that today is the Municipal Theatre. 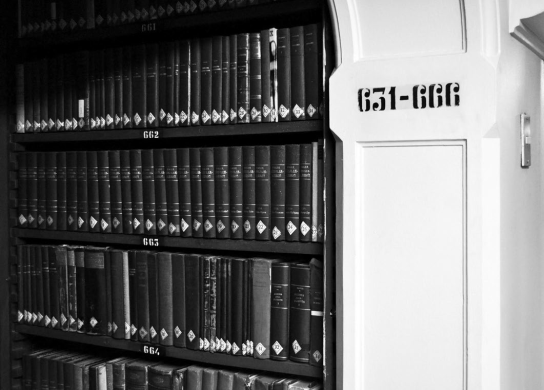 The Library only contained the books donated by the first patriots and the Jesuits’ collection, appropriated after their expulsion. Manuel de Salas, its first director, undertook the task of inventorying these first volumes, which gradually became too many for the space. Then, between 1823 and 1834, the institution was housed in the former Customs building, constructed in 1805 according to the plans of Toesca, in the southeast corner of Bandera and Compañía streets. The collection already amounted to 9,577 books. In 1834, it moved to a building specifically designed to house the 40,000 books it then held (located in the southwest corner of the intersection formed by Bandera and Catedral streets). It stayed there until 1886, when it moved to the Court of Justice Palace, a building of 1,084 square meters and 695 meters of shelf space, a constricted space that had been designed for another purpose (De Godoy, 2017). After four decades in its last location, the celebrations of the Centenary offered the occasion for a change. 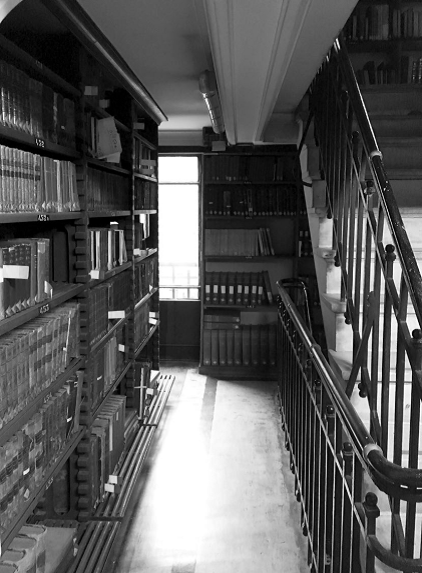 The National Library emerged as an initiative of the Department of Public Works in 1913 with the strong support of the President of the Republic, Ramón Barros Luco. This time, the Chilean government was thinking big. 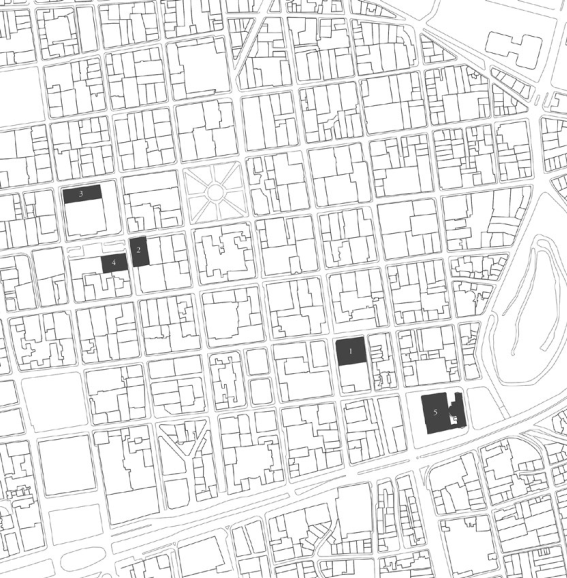 The open call for the competition transmits a firm conviction that public buildings should be built in complete city blocks, which is not the case of the buildings for older Republican institutions, such as the Palace of Congress or the Municipality of Santiago, all cornered in their sites. Among the new buildings of the Centenary (which included the National Museum of Fine Arts, by E. Jéquier, 1905-1910; the new Court of Justice Palace, by E. Doyère, 1905-1911; and the Mapocho Railway Station, by E. Jéquier, 1905-1912), the building for the National Library would be the most ambitious of all, not only for the way it occupies the urban grid of downtown Santiago, but also because it has to juggle with three different programs: the National Library, the Historical Museum and the General Archives of the Nation, all in the block where the Convent and the Church of the Monjas Clarisas had been historically located (Valdés, 2017) (Figure 1). Figure 1 Chile’s National Library: five locations over time. Legend: 1. 1813 y 1818-1823 Universidad de San Felipe, Agustinas / Mac-Iver; 2. 1823-1834 Ex Aduana, Museo Chileno de Arte Precolombino, Bandera / Compañía; 3. 1834-1886 2-story building designed for the Library, Bandera / Catedral; 4. 1886-1925 Palacio Real Tribunal del Consulado, Compañía / Bandera; 5. 1925-2018 Building designed for the National Library, Alameda 651. However, the construction of the building for the National Library acquires a transcendence that goes beyond the single monument and beyond the entire block: it is instead part of a metropolitan system of commemorative buildings, one that performs a modernizing acupuncture within the expanding city, injecting key new buildings that would sustain the nation’s project. Continuing with the process of transformation already begun in the previous century by the mayor Benjamín Vicuña Mackenna, the rationale behind this operation is one informed by the French Hausmannian one: a series of travaux publics are joined by “the formalization of artistic institutions and the institutionalization of architectural education in the Beaux-Arts way” (Torrent, 1995:3). The new architectural additions are not merely buildings but also a way to think the city and to form its future makers.13 The National Library was thus not only a way to commemorate the centenary of the country’s political emancipation, but also the establishment of a public apparatus, whose aim was to materialize a republican social contract, a mode of consolidating a political project through the erection of architectural monuments. And what is at stake in the Library is not its image as a monument but the image of the country which its knowledge is organizing. This is the early twentieth century, however, and France was not doing Beaux-Arts then, but early modernism. In consequence, Gustavo García Postigo’s proposal was a strange version of Beaux-Arts architecture cast in concrete - the first ever concrete public building in Chile, yet absolutely standard14 and backward-looking.15 After the first stone was placed on the 23rd of August 1913, the building’s construction had three stages: the first one, opened in 1929, was the main wing, asserting the new main urban axis’ importance;16 followed by the eastern wing (the Historic Museum), inaugurated in 1939, and was completed only in 1963 with the northern wing - already designed in a less ornamented fashion. Because of the obvious retrospective dissonance that erecting an early twentieth-century concrete building with a Beaux-Arts language causes, the National Library has gathered some criticism - the sharpest among them Horacio Torrent’s one. He is clear: “the symbolic transfer achieved by the transportation of academic architects to South American territories (…), emptied (the National Library’s architectural proposal) of any content” (Torrent, 1995:5). The lack of a feeling of responsibility of the architect García Postigo to the style actually held a potential: the lack of a sound architectural ‘content’ only signaled a certain pragmatism that could result in a space for invention, not only architectural but, actually, cultural. If a National Library is the repository of a nation’s literary production, the sign of its people’s enlightenment, one has to look at how, and what, the library stores. The problem of the Library is then not dissimilar to that of Noah’s Ark, the floating chest designed by God (and executed by Noah), where, as Hubert Damisch’s piece on Diderot’s Ark says, the central problem was not theological, but one of storing (Damisch, 2016). As Damisch points out, the Abbé Mallet’s entry on the ‘Ark’ shows how puzzling it was to evaluate (in both Noah’s time and now) “the ark’s capacity (…) considering how incomplete were the lists of animals then in existence, especially for the still unexplored regions of the world, and thus how impossible it was to determine the dimensions of the vessel ‘relative to its use’ anymore accurately that is done in the Scriptures” (Damisch, 2016:119). How did García Postigo calculate the size of Chile’s National Library deposits, when he was designing not just for his present times, but also for a nation’s eternity? How was he dealing with Diderot’s (1779:635) dictum: “(T) he purpose of the Encyclopedia (and, in our case, the Library) is to assemble the knowledge over the surface of the Earth; to explain its general plan (...) and to transmit it”? If García Postigo’s proposal, as Torrent suggests, is merely the result of fitting the building into a city block (Torrent, 1995:3), another problem must be added: the fact that, from 1925 onwards, a legal deposit bill was passed on top of the 1820 decree that forced the printing presses to deposit in it a copy of each book, magazine or newspaper published within the national territory, a function that continues to this day. The problem of Noah’s Ark becomes then that of the Tower of Babel: an ever-growing structure destined to collapse (Ulloa, 2017). García Postigo’s design takes a stance: he designs not one but two equal deposits, the only two structures that are actually consistent with the material and constructive logic of the building (Figure 2). He designs two concrete-made deposits located in each side of the main north-south axis of the Library: one for Chilean literature and one for general literature (Díaz, 2017). This parti organizes knowledge into two distinct categories, mutually exclusive yet complementary, measuring exactly the same and standing face to face: Chile and the rest of the world. On the other hand, the factory-like concrete deposits also determine the way in which books are organized in space: eschewing the newly-created Dewey decimal system, Chile’s National Library invents a system of its own, one where books find their place according to their acquisition time and, most notably, their size. The architecture of the interior is what determines the way in which all the memory of the world is organized: inside the deposits (this isotropic free-plan, homogeneous and standarized), the stacks’ structure is based on a 3.48 by 3.48 m grid, mirrored in each side of a 1.4 m corridor. The floor-to-ceiling height is 2.27 m dictated by the combination of the minimum inhabitable height (fitting seven cast-iron shelves of 30 cm height) and the maximum measure according to antiseismic precautions: a logical mandate, derived from purely technical reasons, for an optimal storage system. Such a tailored, custom-made, library science of organization, proposes therefore a general and a particular worldview at the same time. Figure 2 Current status of the Chile’s National Library, next to the National Archive building. This pre-modern stance (where particularities reign over standardization) is reflected in the Library’s own more palatial interiors. They, as well as Diderot’s interiors, are made mostly of wood, rejecting the modern world’s dominant materials - glass, metal, plastic. Paraphrasing Barthes, “it is wood which dominates in this great catalogue,” the amplifying machine is one that is still artisanal, where “man (…) participates (…) in a manner that is both active and delicate,” creating a world where it is man’s hands that operate and activate, where there is “no hidden place (spring or housing) which would magically conceal energy,” a world where hands reign, constantly reaffirming man’s familiarity with the objects in operation (Barthes, 1980:28-29). The rooms that activate the machinery - the rooms that make use of the deposits - are all carved or sheathed in wood, adopting the grandeur of the Beaux-Arts’ richness. If in García Postigo’s Library this logic for the interior is complemented by pneumatic tubes, modern heating technology and a state-of-the-art connection to metropolitan services systems (Irarrázaval, 2017), then this is only the kind of contradiction that this building could embody. But the wooden rooms were not only referencing a grander, common-to-all-free-men past (that of French Republican institutions, which this young Latin-American Republic was freely quoting). The Library’s rooms were also mapping the rather abstract territory of knowledge - in a literal way. 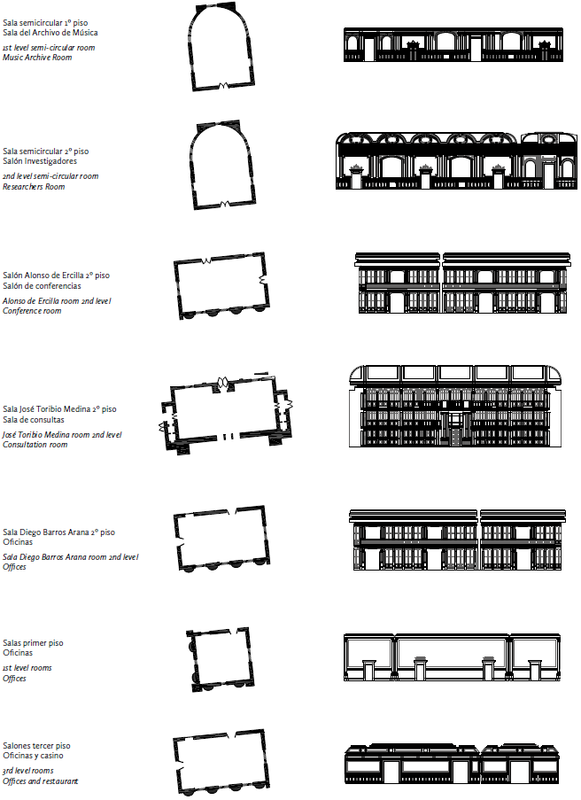 When the National Library opened its doors, the protagonists were a series of “catalogue-rooms” (Solervicens, 2017) designed with the purpose of housing certain prominent intellectual’s collections, such as José Toribio Medina’s room and the Diego Barros Arana’s room. There was also another set of thematic rooms - the Italy room, the Argentina room, the North American room, the France room, the British room, the Germany room - containing collections donated by embassies, countries and institutions, revealing a protomap of political and economic connections. This is not without precedent: Diderot described the project of the Encyclopedia as a world map showing the countries’ positions and interdependences. Knowledge is first set out with different entries as “individual, highly detailed maps,” and the Encyclopedia as a whole becomes a world defined by the relationships of these “diagrammed places” (Lavin, 1994:188). D’Alembert, in turn, defined knowledge through metaphors such as “a vast ocean,” “a labyrinth” and “the globe,” notes Lavin. All these are attempts to give knowledge a concrete place. The Library is conceived as an imago mundi, a representation of the world in the building, the continents and lands materialized in a single construction (Figure 3). 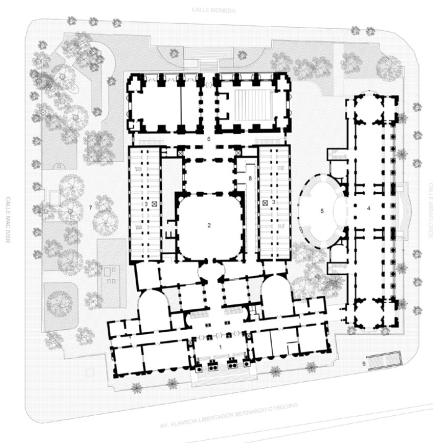 Figure 3 Survey of Chile’s National Library rooms. The shifting nature of the Library’s interiors only reflects the nature of the endeavor of capturing a territory. When Claude Gay aimed at gathering total knowledge of the country, he faced not only erupting volcanoes, but the pure impossibility of the Enlightenment’s aims: in the case of the Encyclopedia “to assemble the knowledge over the surface of the Earth” (Diderot & D’Alembert, 1779); in the case of the library, to contain “toute la mémoire du monde” (Resnais, 1956). But where does knowledge reside in a Library? Librarians of Chile’s National Library tell the story of how, after several books were banned in the 1973-1989 dictatorship, they never removed the books, but only exiled the catalogue’s entry.18 The paper slips containing the position of the banned books on the shelves were kept hidden, making the books invisible until the return to democracy in 1990. The custom-made, height-andacquisition-time organizing logic, made navigating the shelves impossible, so the books didn’t need to be moved. Their invisibility was permitted by the organizing system. Like Borges’ “Atlas” or his “Celestial Emporium of Benevolent Knowledge” (Borges, 1999:229-232) the stacks of the National Library shatter “familiar landmarks of thought” (Foucault, 1966), and more conventional systems of classification by a pragmatic and even a structural logic. These are the most clear and radical classificatory decisions. Like the Chinese Encyclopedia imagined by Borges, the taxonomy that the building of the National Library proposes for the stacks also leads to a kind of thinking without space or place but overloaded “with tangled paths, strange places, secret passages, and unexpected communications” (Foucault, 1966). If libraries not only organize objects and uses in space, but also reflect and build a national cultural identity, then this Library produces not a standard but a very particular world-view. The institution that was part of the continental endeavor of nineteenth-century national identity construction, which involved describing and organizing things, people and knowledge, helped consolidate the idea of what national land was. This sustained an image of the nation’s specificity and positioned it within a shared worldview and language. If inventorying was a precondition for territorial knowledge, appropriation was the requisite to governing it: the National Library, the place where knowledge was held in the form of maps, drawings and writings, was then a repository of both description and project. This means that it was bound to house an irreconcilable paradox: it had to hold inside toute la mémoire du monde but be limited and enclosed by architecture. This paradox, together with the fact that, a hundred years after the construction of this building, the status of the book has once again changed following suit to more technological revolutions, has pushed the typology into new frontiers of debate. The very objects this building conserve and protect are under scrutiny. While this might suggest that the Library could become redundant, it still is one of our Republican bricks. This contradiction between building and institution opens up the possibility for a multi-scalar, polyphonic, critique of architecture and its shortcomings and abilities for materializing ideas. Architect, Universidad de Chile, 2003. MSc Advance Architectural Studies, the Bartlett, ucl, 2007. PhD Architectural Association, 2014. Curator at stadium, Chilean Pavilion at the 16th Venice Architecture Biennale and co-editor of Stadium: A Building to Render the Image of a City (2018). Since 2016 is a professor and researcher at Pontificia Universidad Católica de Chile on geopolitical, territorial and architectural strategies undertaken during the eighties in Santiago related to domesticity (Conicyt 2016-2018). Her latest publications include “Half-Plan” in San Rocco 11, “Footprints” and “Margarita”, both in ARQ. Architect, University of Chile, 2006. MA in Architectural History, the Bartlett, ucl, 2010. PhD Architectural Association, 2017. Has practiced architecture in Chile and her work has been exhibited in London, Rome and Santiago. Between 2012 and 2016 taught History and Theory at the AA. She is currently a professor at the masters program at Pontificia Universidad Católica de Chile and in the first year studio at Universidad Diego Portales. Among her publications are “Margarita”, in ARQ 95 and “Palladian Feet”, in AA FILES 73. In 2017 she was the guest editor of Materia Arquitectura magazine, on the subject ‘Theory’.